New equipment provides improved finish and tighter control, which in turn, gives you better yields and increased productivity. Our 30″ Bliss breakdown reversing mill can handle a full range of production, from .015″ to .250″ material. Our automatic gauge control system and hydraulic cylinders on our 20” mill mean more parts per coil, faster speeds and longer tool life. Our 20″ Temper Mill is just one of the many factors in our reputation for premium quality. Our Temper Mill produces special finishes, as ordered by customers who require proper hardness and temper, as well as certain aesthetic qualities for brightness or texture. 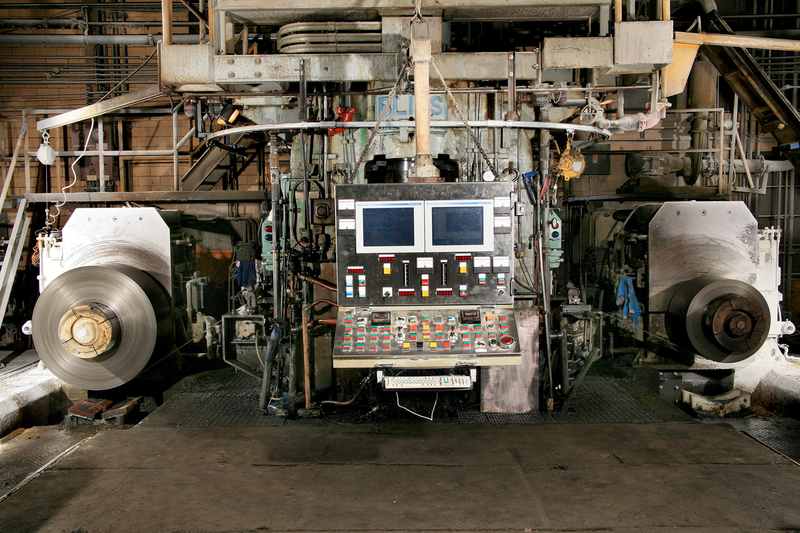 The Bliss 30″ x 20″ Temper Mill with highly polished rolls produces Greer Steel’s No. 2B Best Bright and No. 3 Best Bright appliance finishes for our customers’ most demanding surface applications. Would you like to eliminate grinding, buffing and polishing? Our solutions include Greer Steel No. 2B Best Bright and No. 3 Best Bright, which offer a mirror finish. These steel finishes are great for mirror backs, motorcycle components, appliances and bumper stock. Stop spending money on pre-plating processes and enlist our solutions instead. Improved finish, higher quality and greater consistency are some of the benefits that our new I2S rolling mill is providing to customers. With the installation of this mill, Greer Steel’s temper capacity grew by 3,000 lbs/month, allowed better utilization of the finish rolls, and provided greater diversity of roll finish. Better control for a better product. With new gamma ray gauges and an automatic gauge control system, our 18-inch reversing rolling mill more control and greater accuracy. Our revamp of the Waterbury-Farrell 18″ breakdown reversing rolling mill features computerized controls, superior gauge consistency, roll bending for shape control, and increased production. We stake our reputation on every pound produced.